Hillary Clinton unveiled not only her presidential bid on Sunday but also her new campaign logo — and general consensus, regardless of political affiliation, is that it’s not pretty. But, in all the criticism, one of the crucial things no one is mentioning is what happened last time, back in 2008. Except that these days branding is everything, and if there is anything Hillary should have learned from her last campaign (and from Obama), it is the importance of a good logo. 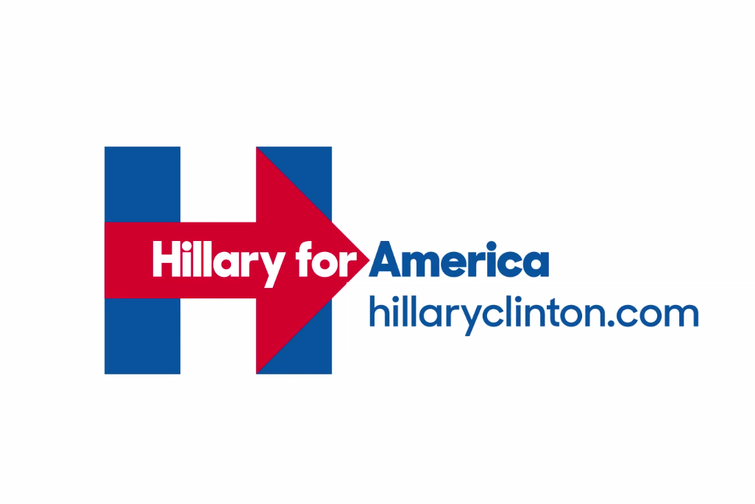 This was her logo during her last presidential run. Look familiar? It should. Not only does it have all the political usual suspects (undulating flag, blocky text, red/white/blue color scheme), but it bears more than a slight resemblance to this Bush/Cheney campaign iconography from 2000 and 2004. While Starbucks and Nike and Apple recognize the potency of a sleekly effective brand message, politicians seem blissfully unaware of the importance of a strong graphic identity. And instead, they just recycle the same artifacts from campaigns gone by, swooping stars and geometrically undulating flags arranged as if by rote, or better yet, by some enterprising child in a Graphic Design 101 class. Political campaigns are expensive, especially presidential ones. Consultants are paid hand-over-fist. But yet graphic designers, and effective logos, seem oddly de-prioritised, candidates unable to acknowledge that a clear visual style is as important as (if not more so) a clear message. Obama nailed it back in 2008. You may discredit the importance of that brilliant “O,” but I stand convinced that one of the reasons for his phenomenal success was his ability to boil his message down to one clear, simple, and very current-feeling logo. Even if it’s repeating the tried-and-true red/white/blue palette (because what is more treasonous than a presidential campaign candidate forsaking its country’s colors? ), Obama’s logo, or better yet, the logo created for him by Chicago-based branding firm Sender, still manages to make the usual colors feel new and original. That now ubiquitous sunrise translated effortlessly to a message of hope and change, a new day we can all believe in (and vote for). He might not have been Reagan, and this might not have been “a new morning for America,” but it was clear that this was a new day, and that day came with its own clear visual message. Which is why it’s all the more disappointing that now, in 2015, this is the best Hillary’s team could come up with. Really? What message does this logo convey, beyond more-of-the-same and “we’re still stuck somewhere in the twentieth century”? I’m not sure which decade it is channelling, but whichever decade it is, it’s not a pretty one. Beyond that, the arrow is pointing right. Is that the message she wants to convey? Stylistically, the block letters lack nuance. The color scheme and shapes reek of simplicity. It’s hard to read. The red on blue is difficult for the eyes. It’s stark and cold. Hardly the warm vibe she seems desperate to convey in her campaign ad. General critical response (beyond castigating Team Hillary for allowing this to be approved) is that we should let the logo slide, since if she wins, it will all be moot. And if she loses, then we can analyze it ad nauseam. But why take that chance? Why not learn something from 2008? If Hillary loses again, it might not be because of her logo. It might not be because of the block text and basic shapes. Last time around, it was because, in the words of Karrie Jacobs, “she couldn’t quite whittle down her message into a single forceful idea.” And yet here we are again. Team Hillary, what’s your message? If Starbucks and Nike and Apple can do it, can’t you? I will go on the record now by saying, if she loses again, it just might be because of the logo. It just might be because of her inability to whittle her message down not only into a single forced idea, but a single and effective graphic identity. Because, at the very least, whatever message you’re communicating doesn’t have to be an ugly one.